Measurement in business is generally a good idea. It allows you to objectively know what has happened. The same applies to data quality – given the importance data has on you marketing effectiveness, and so on; it is a surprise that many more companies are not measuring this. For continual improvement in your business processes – once the data quality is know and how it affects the business, it is very desirable to continue to measure and improve the data. The data is always related to a clear business benefits and improving this all the time provide long term benefits to your business. 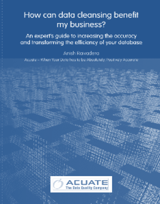 Acuate’s Seven Dimensions of Data Quality is one such measurement technique that measures data quality. See our blog post to find out more.